I posted our first excursion round the farm here, and last weekend we graduated to going out with other horses as well. Sam had been hoping to get some footage then, but although Felix behaved impeccably, it proved too difficult to take footage from a fidgety mare so we tried again this weekend instead. Felix the Wonder Horse from Nic Barker on Vimeo. 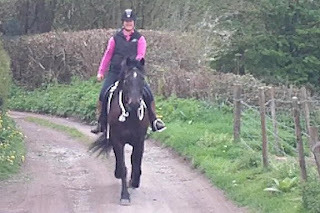 Saffy's owner came to see her on Saturday and we had a great short ride out, so see could see how she was doing, and also got some updated footage of her. Saffy was evidently very pleased to be back doing her old job! As you can see, her landing has improved dramatically on her RF and she is now swinging through much more happily and evenly in front. There is lots of work to do as her feet are changing fast, as I posted last week, but its a very encouraging first step. Saffy from Nic Barker on Vimeo. I've taken some comparison footage of Solomon, who is steadily making progress now that his landing has gone back to normal. 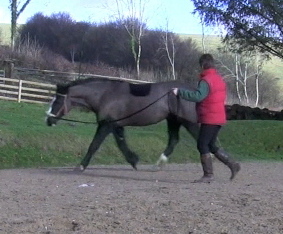 I grabbed these stills from the footage and although the quality isn't great you can see that - like Flynn yesterday - his stride length is better. ...and here he is the second time. Finally, this is him in January, just before he went home last time. 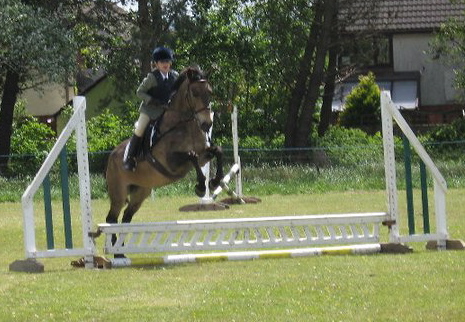 As you can see, he's still not quite as good today as he was then, but he is nearly there, I think. Solomon comparison from Nic Barker on Vimeo. 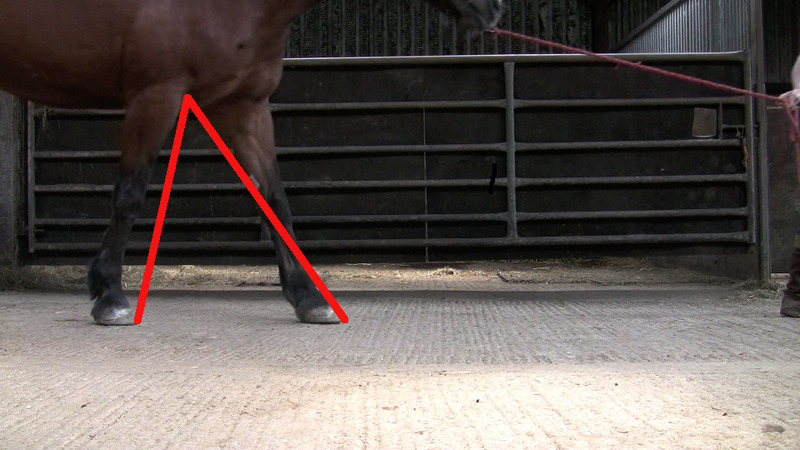 I've taken some new footage of Flynn's landing - its not yet as good as it will be, but he's improved over the last 2 weeks and is beginning to engage the caudal hoof particularly on his LF. His RF is his worse foot and I would expect it to be another couple of weeks before he is capable of landing heel first on that foot. What is interesting, in the meantime, is how much his stride length has improved in a relatively short period. Here is his stride length on day one - I've taken the lines from the top of the RF to each toe, for consistency. Flynn from Nic Barker on Vimeo. Celery in practice, hoof balance and "The hooves are wearing too short!" My new found love of celery as a trimming aid means that I am tending to leave even long hooves alone to see how they react to our tracks. 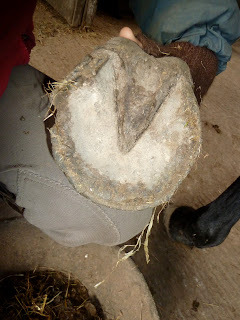 These are Saffy's hooves on the day she arrived (I had asked for her to be left untrimmed - she had been shod before and you can see the old nail holes). The same foot a couple of weeks later. The long hoof wall wore away very quickly - within days. If she were going to a show I would tidy up the hoof wall with a rasp but functionally she has done a superb trimming job for herself. And this is how the loading of a hoof changes once the hoof wall is no longer too long. On the day she arrived, she is balancing on hoof wall - peripherally loading her hooves, exactly as she would in a shoe. Today, loading not just hoof wall but the frog as well and look at what a difference that has made to her overall hoof balance. 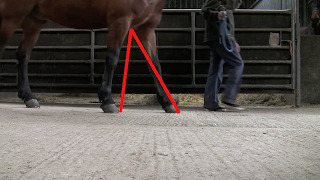 Its a good demonstration, I think, of why its so much easier for horses to have good medio-lateral balance (ie balance which is correct for their own limb) out of shoes AND once the hoof which is loading correctly. 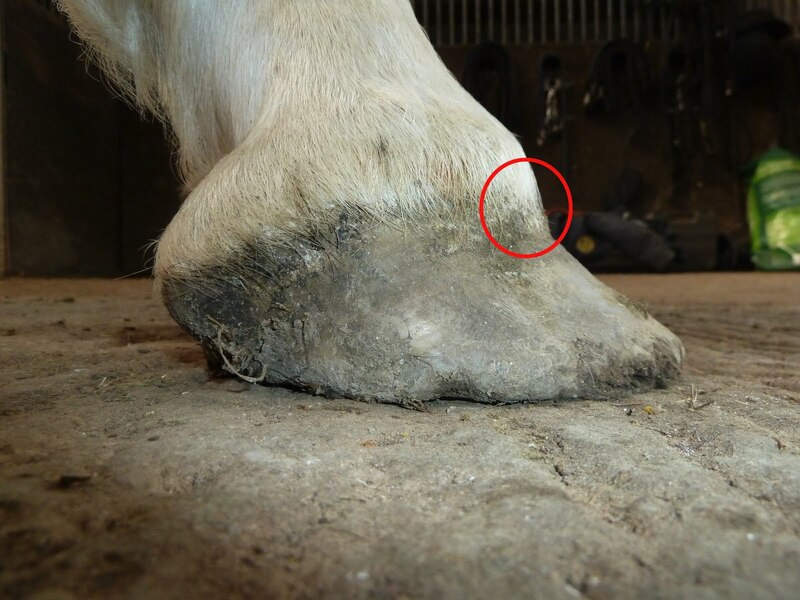 It also illustrates why some people take their horses shoes off only to worry that the hoof is "wearing away" or "wearing too short" once the horse works on hard surfaces. That overly long hoof wall, which is so useful if you want to re-shoe a horse, is actually not what the horse or the hoof want to be loading. 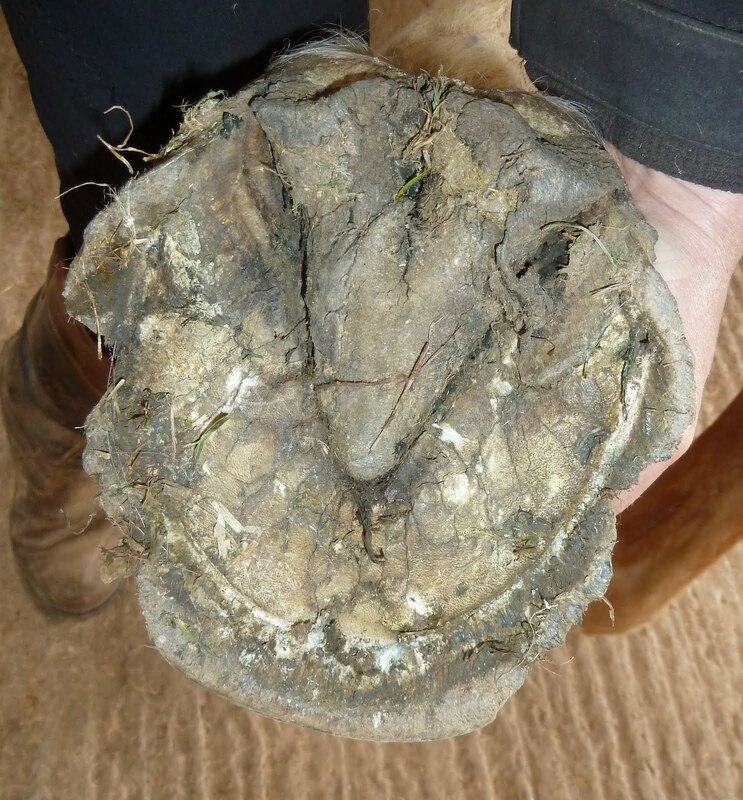 As soon as you put that sort of hoof on a hard surface, the excess wall will chip away until you have a hoof which is loading in a more biomechanically effective, correct way. The frogs also improve dramatically with stimulus. 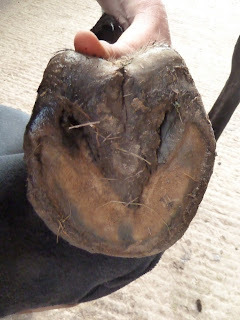 The problem is that if you are used to a shod hoof, this - the same foot 2 weeks later - looks incredibly short. 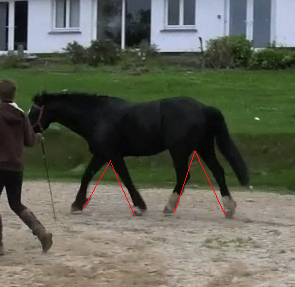 Its actually getting much closer to what the horse needs and is a much more effective hoof than it was 2 weeks ago. She is extremely comfortable on this new foot, as well, which is critically important. Again, you could pretty it up with a rasp but functionally, she has already done most of what she needs to get that hoof working properly for her. Why, why, why, why, why????? Its very often the case that owners notice changes in their horses' behaviour once their horses have been here a while. Its not because of anything special that happens in the way of training but it is (I believe) because horses become more comfortable while they are here. Happier hooves, as I said earlier in the week, mean a happier horse and even a small improvement in landing or hoof structure has benefits for the horse's muscles and leads to a horse who is more comfortable in his neck, shoulders and back. I must admit that dealing with horses' "bad behaviour" is a bugbear of mine - there are so many trainers who focus on dealing with behaviour but for me, behaviour is - not always, but surprisingly often - a symptom not a cause. You could opt to address the "behaviour", but if you can deal with the cause, the so-called "bad behaviour" often goes away on its own. 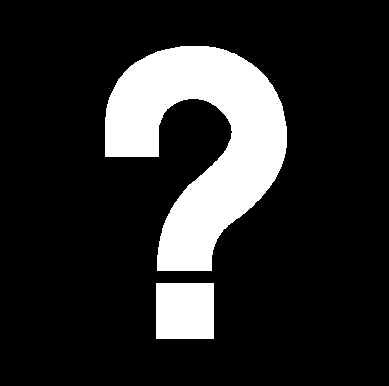 Its back to the old question - why? So let's take one hypothetical horse, and ask about why he is acting the way he is. 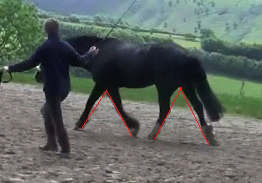 Why is the horse behaving "badly"
- because his back is sore. Why is his back sore? - because his feet hurt. Why do his feet hurt? - because he has damage to his collateral ligaments or deep digital flexor tendon. Why has that damage occurred? - because his hooves load and function incorrectly. Why do his hooves load and function incorrectly? Because of bad biomechanics, (sometimes) inappropriate shoeing and (sometimes) nutritional issues. So why would you try to address the behaviour if you could resolve the underlying problem instead..? "The 5 Whys is a question-asking method used to explore the cause/effect relationships underlying a particular problem. Ultimately, the goal of applying the 5 Whys method is to determine a root cause of a defect or problem." Only one way to train a horse? I found this quote on another blog recently. Its not a blog I normally read, but the post in question was being highly praised so I went to have a look at what was being said. "The only way to train a horse is to inconvenience him when he exhibits a behavior that you disapprove of. You just want to inconvenience him as humanely as possible. " Is it me, or do you agree that this wrong in so many ways? Why on earth would I want a relationship with my horses which primarily consists of me "inconveniencing" them? Of course, there are some "inconveniences" that are part of life - shut feed bins and closed gates probably rank pretty high on the list for some of the horses here - but I'd like to think that, much of the time, my horses are doing things because they find them rewarding and enjoyable, not because I've made every other option impossible. I don't have to inconvenience either myself or my horses by chasing them round the fields when I want to catch them - they come when I appear and holler at the gate and (as they aren't short of grass overnight!) I take this to mean that they are pretty happy to spend the day on the track, eating breakfast, hanging out with their friends and munching haylage. I don't have to inconvenience either myself or my horses when I want them to travel - I am very fortunate because mostly, when my horses go in a trailer, its because they are going hunting and so even the ones who were difficult to load when they arrived at Rockley now self-load, despite our horribly twisty, steep lanes, presumably because they enjoy being out hunting. I am fairly sure that this isn't anything to do with "training" and its certainly not about inconveniencing them - even humanely; there are more effective ways to influence behaviour. Its not because he is bossy or aggressive. He doesn't "inconvenience" other horses or keep them away from feed or water. He does, however, seem to provide calmness, safety and confidence and other horses just feel happier and more relaxed if he is around and in charge. Horses find it rewarding to be around Felix and this is a much better way of influencing behavioiur (in my opinion) than Angel's rather crude approach, which basically equates to "I'm going to chase you and bite you on the bum if you don't do what I want". Angel (in the foreground above) can inconvenience the other horses but, (perhaps not surprisingly), horses have NO opinion of Angel as a decision-maker and view him (quite rightly) as a muppet who has no future in the diplomatic service - good for a game but not for much else. Occasionally I have to force my horses to put up with something that is unpleasant or annoying - being shut in to keep another horse company, or having vaccinations or their teeth done, or dragging them out on exercise when they'd rather be sleeping in the sun - but on the whole I try to respect their likes and dislikes and they seem to respect mine. I don't think I am a pushover, and my horses aren't bolshy, but I don't expect to be the only one who has things to communicate, either. Lucinda Green has always described how, over XC fences, the rider is in charge of the line, the speed and the balance but - if the rider does their job correctly - everything else is up to the horse. 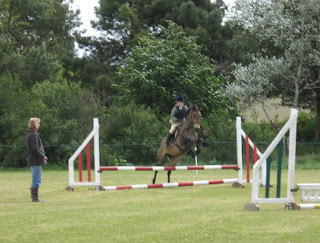 Its the same out hunting or even just hacking out over the moor - the horse has his areas of expertise and I have mine and it needs to be a partnership - if I am asking something unfair or stupid, I need feedback from my horse. I vividly remember once hacking home across the moor and taking a route which I thought was safe. When my horse refused to go forward, it was out of character and I was puzzled but ignorantly I thought he was napping. I gave him a kick and he still refused to go forward, then he deliberately put one front leg out, which sank up to the elbow in a bog, pulled it back, turned his head and gave me a Paddington Bear stare... I got off, apologised and we found another way home. I want to do more than "inconvenience" my horse in training - I want communication and though there has to be respect, it has to go both ways. I'm posting some early comparison photos of Flynn because, even after only a week, a lot has been happening. When he arrived he was very unlevel as you can see from his original footage - not to mention his vet's assessment that he was 5-6/10 lame. He was overdue for shoeing so his hooves were long when he arrived, but look at how quickly they have changed in only 8 days. His frog wasn't functioning as it should, and it was desperate for weightbearing stimulus. These changes are the function of movement on conformable surfaces - no tools required. 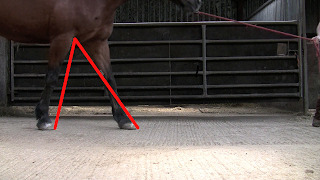 I'm not saying horses should never be trimmed, but for rehab horses, its better to let them build weak areas through correct movement rather than whacking off hoof wall and forcing them to load at our timescale. Changes happen very quickly on good surfaces anyway. Of course Flynn has only just begun to improve his hooves and this is only the beginning, but - though far from sound - he is already feeling better than he was. I took this footage as a quick assessment - it was literally seconds on a circle, but its a useful benchmark. Flynn on circle from Nic Barker on Vimeo. Thoroughbreds can have fantastic feet too! Lucy is a 5 yr old TB mare who is one of our current rehab horses. She arrived with a collateral ligament strain and poor medio-lateral hoof balance but is making excellent progress. 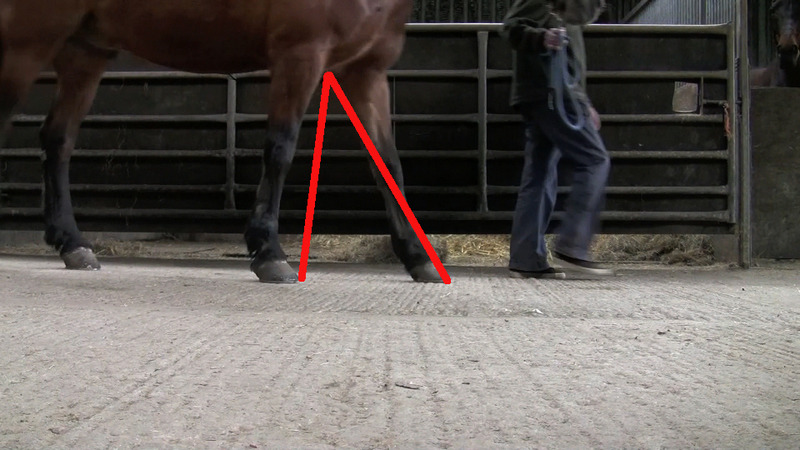 One of the interesting changes in her hooves is at the back - the development of her caudal hoof has been rapid and it also demonstrates how her hooves are rebalancing. Look at the medial (right hand side) heel bulb and how distorted it had become. A few days after shoes are off, the heels and digital cushion have already begun to improve. A few weeks later, a much healthier digital cushion and the medial heel is still weaker and re-balancing. Today, much more balanced heels but as you can see from the ground line of the hoof, there is lots of change to come as the new hoof capsule grows down. I've posted before a comparison with Lucy's x-rays and her new hoof growth seems to be mirroring this. Here is the comparison between her LF in shoes and now - and with a dramatic angle change. The wonderful thing about Lucy is that although she hasn't grown anywhere near a new hoof capsule yet, she has decided that's not going to stop her. Lucy on the roads from Nic Barker on Vimeo. Even though she hadn't ridden him for 6 months he was a very good boy and was very pleased to be out and about. Lynn put these lovely photos up from a show that she, Lauren and Lady went to yesterday. Hard to imagine that a year ago Lady was a rehab horse! Its not been plain sailing but Lynn, Lauren and Dave have worked incredibly hard to bring Lady back to her full potential and that hard work has really paid off. Lady is the most fantastic pony, and she and the family should have many happy years ahead of them. Another rehab horse with an anniversary today is Storm, who also came to Rockley a year ago. I know when horses go home its an incredibly steep learning curve for owners, and as is always the case with horses, there are disappointments and struggles as well as successes, but Lady and Storm were both write-offs a year ago, and what a difference that year has made, thanks to the dedication, devotion and hard work of their owners. Not as cute as foals, but good-looking nonetheless! Going commando aka "Champion the Wonder Horse"
Over the last week I've been trying the next stage of riding with no bridle. I must say its the best fun and I wish I'd tried it years ago! Champion the Wonder Horse! from Nic Barker on Vimeo. "...took Ginger for a gallop on the beach this morning, he loved it!" Wiola has also put up some new footage of Kingsley - his first time schooling under saddle in a year and a half! He had such a lot of body issues to sort out and its a credit to Wiola's patient and correct work that he is made such progress. The footage is not "perfect" but this is a horse who found it impossible to trot AT ALL 6 months ago, let alone with a rider on board. The thing I noticed immediately is how much his shoulders have freed up, and how he is beginning to really stretch out in front - he is going to be stunning! Back at Rockley, Solomon, Zan and Harvey are also making good progress. to this...His caudal hoof is beefing up nicely again and no trimming required :-) Its not that the heels needed lowering, it was the frog that needed stimulating. 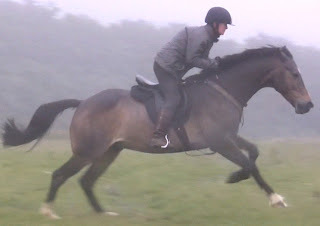 The reason for the fast change is the time he is spending on the conformable surfaces - on them he will always land heel first which gives his foot the right stimulus. Even on concrete although he is not perfect his landing is much better than it was a week ago. Solomon May from Nic Barker on Vimeo. The new hoof angle will, as always, bring his toe back of its own accord (again, no need for trimming!) and will result in a more supportive heel as well. Harvey from Nic Barker on Vimeo. Zan has been here much longer than the other 2 but had shockingly thin soles which has delayed his progress because its limited the work he can comfortably do. 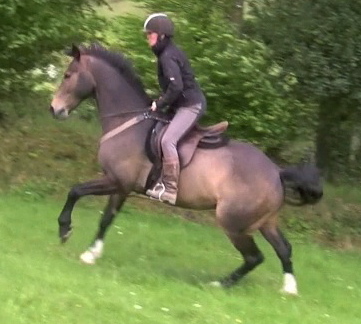 He is getting there though, and has a fantastic new angle change to show for himself. This will be a big help to his thin soles as well, since the new angle will allow the sensitive internal structures to be suspended higher in, and be better protected by, the hoof capsule. Zan from Nic Barker on Vimeo. Box rest and remedial farriery with roller shoes hadn't improved her and even in light work she was going lame. RF - her hooves are long as I'd asked for them not to be trimmed just before she arrived. She has been shod previously, as you can see from the old nail holes, but has been out of shoes for a few weeks. 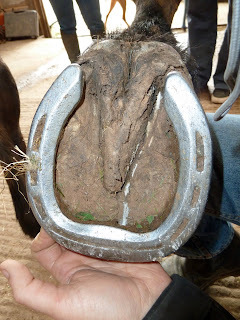 From behind, there is a clear difference between medial and lateral sides of the hoof. Interestingly, on her video footage her landing is worse on the RF, rather than the LF, possibly because she has been overloading the RF previously. Flynn arrived shod all round, with natural balance shoes in front. He was extremely unlevel (his vet assessed him as 5-6/10 lame) and worst on his RF. He'd clearly been landing toe first for a long time and had a weak, infected frog on this foot as well. His heels were high and he had a long toe - he was overdue for shoeing but I'd asked for him not to be reshod just before he came down here. This is a great photo for demonstrating how even NB shoes - which are supposed to give more emphasis to the frog and caudal hoof - effectively prevent frog stimulus. You can see that all the load is taken peripherally rather than caudally. 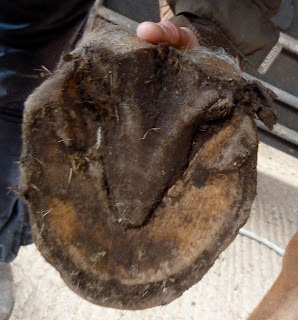 And the result over time is a hoof which has been weakened caudally and is no longer functioning as it should. I've left the audio on Flynn's footage, as you can hear as well as see how unevenly he was landing. 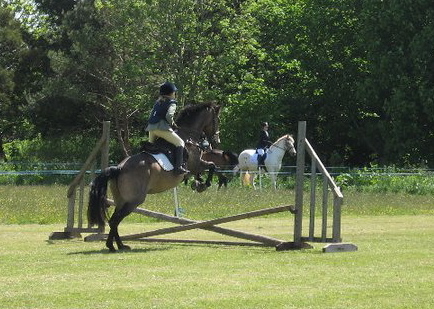 No-one said "Don't try this at home..."
Harvey - Quarter Horses can do it too!